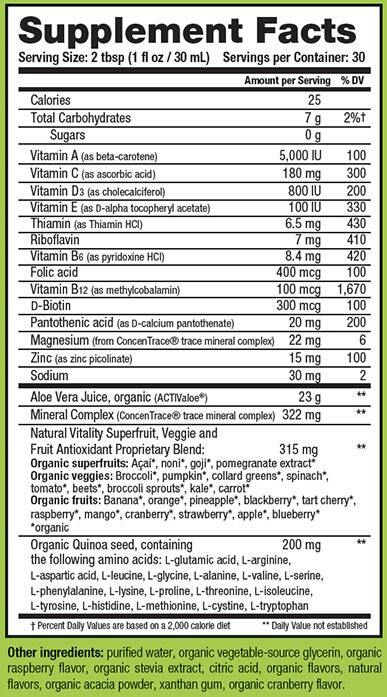 Organic Life Vitamins is rated 5.0 out of 5 by 1. Organic Life Vitamins is one of the top-selling multi vitamins and the top liquid multi in the natural products marketplace. It has won numerous awards and prestigious recommendations. OLV is packed with organic plant-sourced energy along with other important nutrients to give your body a daily foundation of premium nutrition. Liquid: We believe liquid is a superior delivery system for supplements. Taste: We designed OLV so we could take it ourselves. We wanted it to be a good experience, and that starts with taste. We don’t like cough-syrup sweet or heavily green-tasting liquids. We use organic flavors and sweeten with organic stevia. Organic Aloe Vera: Aloe vera contains over 200 amino acids, vitamins, antioxidants, minerals, enzymes and sterols. We put 23 grams of premium organic ACTIValoe® in each serving. It’s an organic whole-food functional multi within a multi. We believe in organics, so we made sure that our superfruit, veggie and fruit blend included only organic produce. To us it’s worth the extra cost, not only for the health benefits but also to support organic farming. Covering nutritional bases: A multi should be well rounded, but we believe it isn’t honest to put a lot of items on a label in very small quantities that don’t really do anything. We use enough of an ingredient to make a difference. And we don’t shop for the cheapest ingredients to give our product a price advantage. Instead, we look for the best forms we can get. OLV has 800 IU of vitamin D3, 322 mg of trace mineral complex, key vitamins and amino acids from organic quinoa seed. Feel the difference:If you’re using premium fuel there should be a noticeable difference. We believe a supplement should be effective, not neutral. You should feel the difference when taking it and miss it when you’re not. Rated 5 out of 5 by Js55 from Love this product!! I have been taking Organic Life vitamins for a few years now. I will not be without them. They are by far the best multivitamin I have ever used. I am 63 years old and my doctor marvels at my routine blood work every year. These vitamins work.